Boy oh boy are these a diet buster. I mean I guess they would be if I was on a diet 😉 These Fried Mac & Cheese Balls are crispy on the outside and full of creamy cheesy decadence on the inside. What’s not to love? You guys, I have heard about Fried Mac & Cheese balls for years. I have no idea what made me wait so long to try them. There are NO WORDS for how deliciously naughty these little cheesy noodle stuffed fried balls of goodness are!! This is the PERFECT way to use up leftover macaroni and cheese. I will never ever throw away leftover mac and cheese now. And? 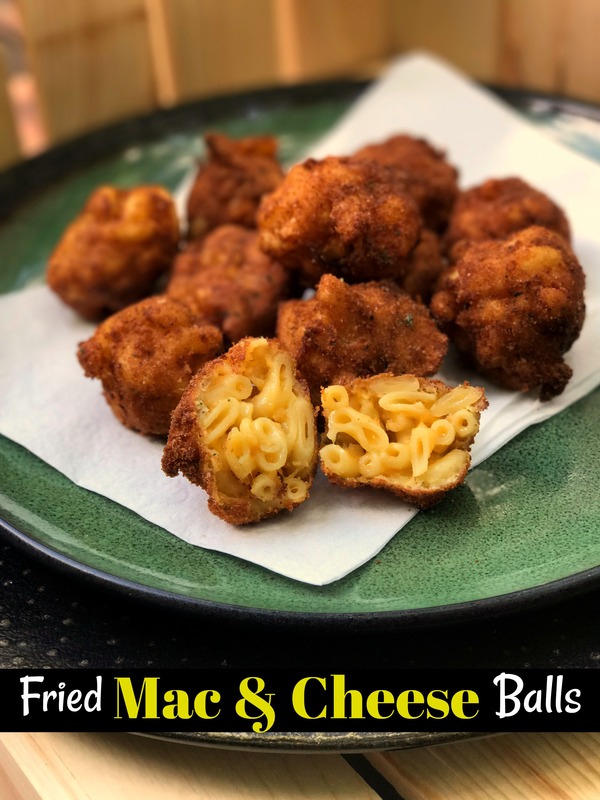 They are so insanely good that I am thinking about making a whole pan of mac and cheese just so I can make these Fried Mac & Cheese balls again. The recipe is a little vague when it comes to the amounts of egg, flour and bread crumbs but that is only because it depends on how much leftover Mac & Cheese you are working with. I just started out with 1 egg, 1/2 cup flour and 1/2 cup bread crumbs and added more as needed. Please for the love of everything that is good and Holy, make these!!!!! Using a small cookie scoop, roll macaroni into 1 1/4 to 1 1/2 inch balls. Roll them around pretty hard in your hand, squishing into firm balls. Roll each ball in the flour, and then dip in egg and then roll in the bread crumbs. Once you have finished all of the balls, Add them in batches to the hot oil. Fry until evenly golden and crispy, about 3 minutes. Transfer to a paper towel lined platter and sprinkle lightly with salt. Repeat until all of the Mac and Cheese Balls are done. Serve with Ranch dressing for dipping and ENJOY!!! I HAVE to make these for Josie! !